When the Nikon AF-S DX 40mm f/2.8G Micro lens was announced I was very surprised, mostly because of the price. A macro lens for less than $300 was unheard of until this lens. Prior to this lens I would generally recommend either close-up filters or extension tubes to photographers wanting to get into macro photography. However, this lens changes that recommendation for Nikon APS-C (DX) users. Macro lenses tend to be quite expensive, even third party options. But at $279 is this lens any good? The short answer is a resounding “yes”. However, there are some things you need to be aware of before you buy this lens. This lens is designed for DX bodies such as the Nikon 3000, 5000, and 7000 series of bodies. If the lens is used on a full frame (FX) body the image will be cropped, resulting in a lower resolution image. If used on a 24 megapixel full-frame (FX) body the captured image will only be about 14 megapixels due to the crop factor. The minimum focus distance is a very close 6.36 inches. This is not the distance from the front of the lens, but from the image plane (sensor). The actual working distance is about 1.3 inches from the font of the lens at maximum magnification. That means if you are interested in photographing insects, this lens will not be a great choice unless you freeze your subjects. However, this lens is great for things like coins, stamps, jewelry and flowers. Image quality is excellent, especially when stopped down to around f/5.6 – f/8. Images are very sharp and good contrast. At the closest focusing distance the image quality is still very, very good. the lens does vignette at the widest apertures, especially at the closest focusing distance, but this is easily corrected when shooting in raw. JPEG shooters will find this lens is autocorrected on most bodies. distortion control is excellent, although due to the short 40mm focal length and the super close 6.36 inch minimum focus distance (1.3 inch working distance) you will find some perspective distortion. This is not the fault of the lens, but physics. Chromatic aberration is well controlled, although there is some at the max aperture, but again this is easily corrected when shooting in raw or is automatically corrected when used on most Nikon DSLR bodies. Flare is well controlled due to the deep design of the front element. The included lens shade is almost unnecessary. Th build quality is very good for a consumer lens. It uses a plastic body but the lens mount is metal. 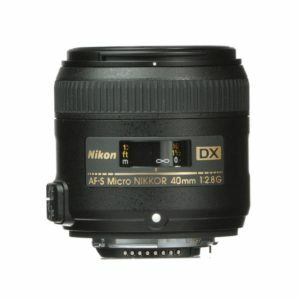 I recommend this lens for photographers looking at getting into macro photography on APS-C (DX) bodies on a budget. You can spend $279 on a set of extension tubes but won’t get the quality you get from this lens. That is, unless your interested in photographing insects, in which case I recommend the Nikon AF-S 85mm f/3.5 Micro VR lens as a minimum. Although, I prefer the even longer lenses such as 105mm to 180mm lenses as these lenses provide a much longer working distance which makes photographing insects even easier. based on 715 user reviews online.